In todays fashion of open plan living, the dining table has become a very important part of styling our most lived in spaces. Having a custom dining table made ensures that the table is perfectly suited to your personal style, the aesthetic of the room, the size of the space as well as the dining chairs. The "Mr Jarman" dining table, is a unique rounded rectangular shape with perfectly angled and tapered legs. The piece is made from beautiful creamy coloured select grade Blackbutt timber with its subtle grain lines and silky soft texture. A blackbutt timber dining table is a beautiful neural tone that will work with many styling colour palettes from bright to pastel to dark and moody. The bevelled edge dining table top links the rounded shape of the top with the angles of the legs. The top is finished with our much loved natural oil and wax finish Osmo. This finish is hard wearing, non-toxic and easy to care for. Follow the link here for more information on Osmo. We where very excited recently to be involved in this photoshoot organised by Geelong Creatives shot at the home of Concrete Crush by MB Captured. The shoot was styled by pieces made by our fellow very talented Geelong Creatives such as the awesome large paintings by Studio Intrica and floral display created by buds by sophie. Alison Collins is the co-owner of Bombora Custom Furniture and in charge of all things other than making furniture! At Bombora Custom Furniture, we sure love an industrial dining table with black legs and a beautiful reclaimed timber top! Our latest dining table design, the Centreside dining table, is simple, bold with a touch of luxury. Curved, tapered and angled steel legs fit snugly under a character filled recycled Messmate timber top. The reinforced powder coated legs make for an extremely solid dining table which will last a lifetime. Suited for both a dining or meeting table, this practical modern industrial design considers the placement of legs to allow for a maximum number of diners while being economical in space. The combination high character Messmate timber with matte black metal legs enhances the black recycled features in the timber creating a perfect balance. All Bombora Custom furniture, pieces are made to our clients specific dimensions, timber type and character level. For this reason, the legs for this bold statement dining table are make to order by fabricators in Melbourne creating a perfect fit for every piece. Please contact us here if you wish to discuss commissioning Bombora to create your dream industrial dining table. Elina Gault is Bombora's admin extraordinaire who splits her time between her native city of Melbourne and beloved adopted city of Barcelona. We are very excited to be involved in an inspiring initiative, Created With Care. It isn't every day that Luke gets to indulge in his artistic side in collaboration with an artist. Over the last few months, he had the pleasure of working with Tanya Keenan on a piece of furniture to be auctioned off with all proceeds going to their local charity of choice, the Spirit Foundation. The Created With Care initiative is the brainchild of two Australian online marketplaces Handkrafted and Bluethumb. The two creative companies believe very strongly in the value of partnerships; that together we can have greater impact than going it alone. Fred Kimel (Handkrafted founder) and Edward Hartley (Bluethumb co-founder) paired a furniture maker with an artist and left the rest up to them. Luke's collaborator, Tanya Keenan is a self-taught artist and mother of 3 from Geelong. Tanya’s art is inspired by her love of life, nature and is a reflection of her inner self. Tanya loves to experiment with different textures, applications and colour combinations that evolve into what she refers to as “landscapes of her mind”. You can check out her work here. As is so often the way in a close knit community as it is in Geelong and the Surf Coast, an instant connection was found between Luke and Tanya, with a shared love of the region as well as knowing some of the same people. They wanted to create a piece that reflected the natural environment that they love so dearly. To convey that feeling of a perfect summer day where the sun, sand and water all blend together into an almost dream like state. Acting as both the canvas and frame, the buffet is based on Bombora's Wye River Buffet. Luke’s timber selection of the light and clean American Ash accentuates the sand colour and bold blue tones of Tanya’s beautiful painting. Perfectly spanning across the 4 cupboard panels, the painting extenuates the clean, simple and classic silhouette of one of Bombora’s signature designs. With the intention of supporting the local communities of Wye River and Separation creek after the 2015 Christmas Day fires, Luke, Tanya and everyone involved happily donated their time to create both awareness of and funds for our chosen charity The Spirit Foundation. The foundation was initially established as a charitable trust in 2013 as the Casey Tutungi Future Fund. It was set up to raise and manage donations that were given in support of Casey Tutungi and his family after an injury sustained playing football resulted in quadriplegia. The trust was also set up to be able to provide support for other local community members in need. Following the bush fires in the Wye River and Separation Creek in on Christmas Day 2015, the fund branched into assisting these communities. “We are providing funding to the members of the community who have suffered hardship as a result of the fires” says one of the foundation's directors Peter Spring “the directors of the Spirit Foundation are working closely with community leaders at Wye River and Separation Creek to identify the best ways in which we can assist the wider community and individual members, including direct financial support to individuals as well as for infrastructure projects including refurbishment of first aid facilities at the Surf Club”. The Created With Care auction is open and final bids must be received before 5pm on Friday the 10th of June. Bids can be placed at www.createdwithcare.com.au. Thank you to the fabulous Britton Timbers for the donation of the beautiful timber used in this piece. Please click the share button below to help us make the biggest impact possible! Elina Gault is Bombora's admin extraordinaire who splits her time between her native city of Melbourne and adopted home city of Barcelona. Tight in grain and creamy light brown in colour, this recycled Blackbutt sideboard is bold and contemporary. Special attention was taken to create a balance between the altering tones of each individual piece of timber used in the door of the piece. The black angled legs ground the light toned carcass which are further linked visually by the dark shadows created on the sliding doors by the slats and finger holes. The legs are constructed from matte black powder coated steel to ensure longevity and to support the weight of the piece whilst maintaining a top heavy aesthetic. The position of the shelving is adjustable to allow for alteration of the height and configuration for a perfect fit for your possessions. Lower than a traditional sideboard, this piece is versatile for your requirements whether it be dividing up a space or sitting below a windowsill. These dimensions can be customized to fit perfectly in your home. Finger holes where used rather than handles on this piece to create a streamlined look and as another point of visual interest. As this piece is made to order, clients are welcome to specify size, timber type and the character level of the timber. Please contact us here if you wish to discuss commissioning Bombora to create your dream piece of furniture. Elina Gault is the admin extraordinaire at Bombora Custom Furniture who's passions are design, travel and creating efficient systems! Why should I choose custom made timber furniture for my home? Choosing furniture constructed from recycled or sustainable FSC certified timber greatly reduces the impact your purchase has on the environment in comparison to pieces created from man made products such as veneer, chipboard, steel or plastic. There are very few resources used to convert the timber from a building, pier, bridge or tree into a stick of timber. In addition to the low amount of resources required to produce a piece of solid timber furniture, the longevity and durability of the piece also ensures that it will not need to be thrown away and replaced, the ultimate sustainability. FYI, the Forest Stewardship Council (FSC) is a global not for profit organisation that provides certification for the responsible management of forests and forest products. It promotes the environmentally appropriate, socially beneficial and economically viable management of the worlds forests. You can look for their logo on all sorts of forest products including printing paper, toilet paper and timber. Creating beautiful surrounds is something that we as humans crave. Timber is a material that is very versatile, malleable to styling and most importantly beautiful. It is unique, alive and has a story. Most often these days our homes are created from materials such as tiles, metal, stone and concrete, timber brings a warmth and life to this palette, creating a sense of home. Alongside the usual timber furniture such as dining tables and tv units, we also create pieces of "fixed furniture" such as solid timber bench tops, timber vanities, inbuilt storage and bookcases. These pieces of timber cabinetry and joinery bring a sign of life to these spaces, balancing out the harder building materials. The two factors that contribute to the longevity of solid timber furniture is the timelessness of the style as well as the durability of the material. With a well considered design, a piece of solid timber furniture will always be in style as timber is very malleable to changes in styling fashion and the material itself is timeless. Durability is the other vital aspect of longevity, the construction of piece and the finish needs to be able to last the tests of time and use. The natural oil and wax finish that we use on our furniture is very hard wearing and ensures that the piece gets better with age with the development of a patina. The solid timber used in the construction as well the the choice of finish enables the piece to be spot fixed in the case of a scratch or sanded back and refinished in the case of more substantial damage. This is not possible with man made products that overtime become worn, scratched and dented, only fit to be thrown out. Getting a piece of custom made furniture provides you with the opportunity of perfection, the ultimate choose your own adventure. At Bombora, we see the design process as one of collaboration, combining the functional and aesthetic needs of our client to create a piece that they don't just like but love. Aside from creating completely unique designs, we also adjust all of our portfolio pieces to ensure that they fit perfectly into our clients home. This can mean looking at the dimensions of your chairs to create a dining table that is just the right size, altering the design of a timber vanity to fit perfectly into your bathroom or creating the shelving in your TV unit around your technology. Want to discuss working with us to create a piece of custom made timber furniture for your home or office? Please contact us here! Alison Collins is the co-creator of Bombora Custom Furniture and in charge of all things other than making furniture! The style industrial, covers a whole range of aesthetics from rustic, to up-cycled all the way up to luxury. It is the pairing opposites like hard, shiny and new materials such as metal, tile or concrete with softer and alive materials such as timbers and foliage. It is the combination of the sleek and smooth powder coated steel with the raw realness of recycled timbers. It creates a strong look, contemporary, modern and punchy yet creates a perfect foundation on which to add on trend styling items. We have greatly enjoyed creating a whole range of modern industrial dining tables that pair matte black timber or metal with beautiful recycled timber for a bold yet luxurious look. The addition of the metal creates a whole other dimensions to play with! The black in the table legs enhances the natural features in the timber such as the sap lines and the recycled features. This contrast of materials also creates a statement that timber just cannot make by itself. So often in dining table design, the legs are lost under the shadow of the top and the surrounds of the chairs. Having a strong profile as well as the black color ensures that the legs are not lost but balance out with the top as equals. To create this modern industrial look in our dining tables, we have paired either matte black powder coated steel legs that we have fabricated in Melbourne or black painted timber. As with all of our furniture, the tables are made to order to ensure that the piece is the perfect fit for our clients home and chairs. You can also choose the type of timber that you prefer for the top as well as the level of recycled character. Please contact us here if you wish to discuss commissioning Bombora to create a custom or bespoke piece of furniture for your home. Alternatively, you can contact Alison on 0407-906-799. Custom Timber Furniture Maker - why choose us? These days there are a lot of custom furniture makers out there so what makes Bombora different? Why should you choose us?? To us at Bombora, you are a person not a piece and as your furniture goes through our admin and workshop processes it doesn't have a number, or the design description on it... it has your name. Your piece of furniture is important to us, we put love and care into it as we know that it is and will be very important to you. Whether it be the table you and your family share meals over, the buffet you run your fingers over every time you walk past or the TV cabinet that you find yourself staring at rather than at "the Block", we take great pride in the fact that our furniture helps to make your house your home. Each piece of Bombora custom furniture is created from start to finish by a single one of our talented furniture makers who take great pride in their work and the finished product. All of our furniture is made by hand not by a computer. This results in a much better quality product, from the placement of the boards, to the quality of the construction, to the look and feel of the finish. It is our goal in the admin team, for you not to have to contact us is any stage of the process wanting to know what is happening. From the start of the process, we will let you know the timelines for what is happening and when. We will also contact you at certain predetermined points through the production process to let you know what is happening and to arrange the next step of the process. Our level of service doesn't just stop at the end of production, we also organise your delivery as well as send you detailed instructions on how to care for your furniture. Being an eco-responsible business is a top priority for us at Bombora. We have developed the one piece one tree initiative to counteract the environmental impact of producing your piece of furniture from the milling of the timber, the machinery to produce the piece as well as the transport of all of the consumables, timber and the finished product by planting a tree for each piece of furniture that we produce. Find out more about this initiative on this blog post. 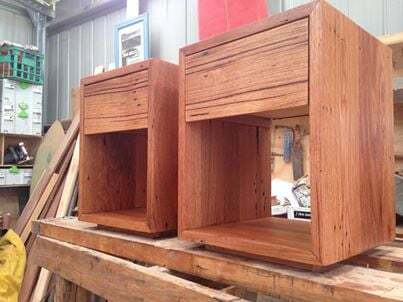 What we love about recycled timber is that every piece is completely unique and as it has been grown in natural conditions, it is full of character. This character or feature are such things as knots, sap lines, sap pockets, bolt holes, tonal variations and prominent grains. Creating furniture from heavily featured timber takes more time and skill than using new or low feature timbers. Time and an eye for aesthetic is required to lay out the boards in a way that is balanced, appealing and does the timber justice. It also takes more time and finesse to finish the timber properly as each feature needs to be hand filled to ensure the final product is completely smooth and is free of gaps. Creating pieces with a high level of feature is what we love to do! Each piece of furniture that we create is a one off and we treat you and the piece so from beginning to the end. We firstly send you a detailed questionnaire to ensure that we have all the information that we need for the design, function and dimensions of the piece as well as specific information on your preferences for natural and recycled character levels in the timber. Whether you get a portfolio design, an amended portfolio or a fully customized piece, Bombora owner, head designer and furniture maker Luke will use the information from your questionnaire to generate you design drawings of your piece. If any further changes to the design are required, a revision to the original drawing is then possible. Just as each piece of recycled timber is unique, so are your tastes. Luke hand selects the timber for the piece based on your preferences from the questionnaire and then sends through images for your approval. If desired, you can also come to the workshop to personally choose the timber or you can join Luke at the timber yardto make the selection off their racks. Fill out a contact form here. An often forgotten piece of furniture is the bedside table. As is commonly the way with the final touches to a room, the bedside tables is a piece that can either tie the whole design together or make it fall in a heap. This humble piece of furniture has so many options for both function and form from a simple u shape or box, to a mini dining table all the way up to a multi drawer super storage showstopper. As well as creating a matching set, we also love to work with our clients to create pieces that work beautifully with their existing bed. What do you plan to store in or on your bedside table and what would work best to house these in? Drawers, a cupboard, a shelf, a combination or no storage at all? Do you want your bedside tables to be a feature of the space or to blend in with the bed and other furnishings? To make a piece of furniture stand out in a space, consider aspects like size, using contrasting materials, feature filled timber and color to really make it pop. As they say, storage is king. We have had several clients in the past who where space deficient and needed to make the most of each opportunity for storage. The beside tables that we created for these clients ended up being mini low boys to fill up all the available space whilst maintaining the right proportions to be aesthetically pleasing. Height is a very important dimensions to consider for a bedside table and it all comes down to personal preference of whether you like the height to be the same as, lower or higher than your mattress. I personally like it to be just higher than the mattress for ease of accessing my phone or book without the treat of accidentally falling out of bed. 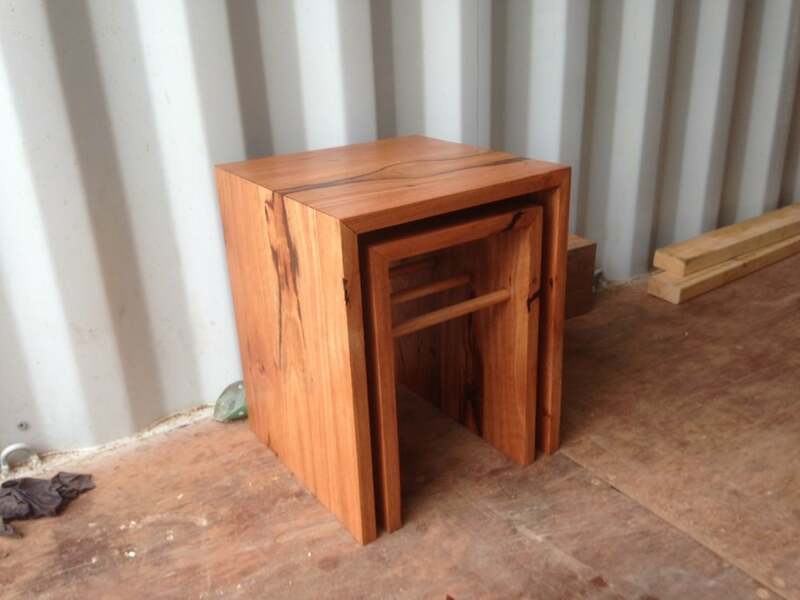 Below are some examples of mainly recycled timber bedside tables we have created for clients. Please contact us here if you wish to inquire about commissioning Bombora to create some custom bedside tables for your home! Alternatively, you can contact Alison on 0407-906-799. A solid timber bench top, with its warmth, life and styling malleability is a beautiful addition to any kitchen to create a welcoming atmosphere. Timber works so beautifully in any aesthetic such as a modern, traditional or even a luxe industrial kitchen design to balance out the harder materials such as tiles, concrete, stone, stainless steel and laminate. We have created such pieces for our clients kitchens as solid timber bench tops, waterfalled kitchen island benches as well as drawer fronts, cupboards, bulkheads and cladding. With the continuing popularity of open plan, the kitchen is often a part of the dining, living or family room making the continuity of the design and styling with these other spaces so important. We love having the opportunity to create multiple pieces for a client that will be placed in the same space such as a dining table, buffet, TV unit and inbuilt shelving. Having the same timber type and character level used across all pieces as well as subtle design features ensures a flow and congruence of the styling with in a space. Timber is also a very forgiving material in these high use areas. The natural oil and wax finish we use penetrates into the timber to ensure a deep protection from staining and liquid spills. Having this natural finish also means that if a light scratch does occur that it is easily repaired locally with an application of product or if a deeper scratch occurs renovation can be done simply and in situ with a gentle sand and reapplication of the finish. The surface is also easy to care for with just a one monthly application of an aerosol nourishing wax for very high use timber bench tops required to maintain its protection from stains and liquids. Click on the link to see the Osmo maintenance products in action! Click here to find out more about the Osmo natural oil and wax finish we use on all of our furniture and why we love it! Here are a couple of examples of some of our custom timber bench tops in recent projects we have been involved in. 40mm thick Wormy Chestnut timber bench top with waterfalled legs. The light brown tone of this timber looks beautiful with the white cabinetry. Red Ironbark timber bench top over cabinetry creates very useful storage in a small space. Please contact us here is you would like to discuss your project with us! Alternatively you can contact Alison on 0407-906-799. Truly custom made furniture is a collaboration between client, designer and furniture maker. A client comes to us with a vision, a collection of images or a carefully thought out drawing and a burning desire to see it come to life. Our designer takes these ideas and factors in the practicalities of function as well as an aesthetic of balance formed from years of experience. The furniture maker then takes the drawings and the clients preferences for timber to bring everything together. Little adjustments are made to allow for the uniqueness of the timber, finer details are refined for optimal function and senses are used to perfectly place the pieces of timber, to smooth out the bumps and create a truly touchable surface. It is this process of co-creation that is what furniture making is all about for us. This is what is so rewarding, so fulfilling and exciting. As someone great once said, "necessity is the mother of all invention". This is a great description of the bespoke furniture design process. Necessity is in the clients minds when they look at a space they want filled, when they envisage their new home and when they consider how they can make a room more their own. Invention is in the designers mind when they balance the clients desires with what is possible and what could be possible. It is this moment that is so exciting. The moment of creation, of invention, the melding of ideas, of finding solutions, of creating beauty. When the building is done and the timber is brought to life with oil, we love to see that sense of ownership in our clients eyes, that amazing feeling of seeing something you have dreamed about come to life and be even more awesome than it was in your minds eye. To see it placed within their home, to be surrounded by their possessions and to be dressed up by their treasures. It is only then that the process of creation is complete. Contact us here if you wish to discuss your project with us or alternatively you can contact Alison on 0407-906-799. Alison Collins is the co-creator of Bombora Custom Furniture and is in charge of all things other than making furniture. Bali is a place of many contrasts. Great luxury, beauty and decadence that coexists alongside poverty, rubbish and decay. Our recent trip to Bali has been very inspirational and we will be integrating elements of the modern Balinese interior design style into our own home. Below are some simple concepts that could be applied beautifully to all design aesthetics. The seamless integration between outdoor and indoor spaces is quintessential in the modern Balinese style. Gardens flow into the indoors and plants are a common feature of any room. Having deliciously warm weather year round of course enables open air spaces and internal gardens within the homes, hotels and villas of Bali to work unlike our own chilly Victorian climate. We have however created our Surf Coast version of the outdoors inside concept with an L- shaped layout that ensures that every room has several windows looking onto garden. We have also included an excess of windows and two feature light wells with full length windows. What we are going to bring home from the Bali trip is to take our obsession with potted indoor plants to the next level by creating mini potted bonsai gardens that we have seen so often throughout our journey. We will also be carefully designing the garden around the aspect seen from each of windows of the house to make the garden feel as it is within the interior space. Whether it be a pond, potted water plants or a trickling musical delight, water is a common feature in modern Balinese interior design. Having two small children, an indoor water feature would be a safety and tidiness disaster however this is something we really want to integrate into the design of our home. It is instantly relaxing to hear the gentle trickling of water so we are planning a water feature combined with some lush water plants in the light well adjoining our home office. This feature will be designed to be admired from the study windows with the rest of the space to be landscaped along the same aesthetic. Our style, what I would describe as modern organic, is very similar to the modern Balinese aesthetic just with more of a lean towards the luxe industrial. Clean and simple lines are created using natural materials such as stone and concrete with softening by timber and greenery from indoor plants and garden views. What is often done so well in Balinese interior design is the amount of detail that is put into the timber work with traditional joining techniques used and stunning timber beams exposed. This detail highlights the timber to creates a lovely balance with the other painted, tiled, concreted or carpeted surfaces with the room. We will be looking to create a greater balance within our own home by putting more potted plants within the bathrooms as well as using timber trays and bowls for both function and beauty on our harder surfaces such as our Caesar stone island bench. I will also be softening the polished concrete floor within the lounge room area with a beautiful rug. The exposed joinery is not something that we want to have in our interior however this is something that would work fantastically in our exterior with the pergola and outdoor seating area that we are yet to create. Something that I have admired throughout Bali has been the stunning pendent lights, I only wish I had taken more pictures of them! It has amazed me how with the right lighting, a space can be transformed from simple to romantic and luxurious. In many of the Villas, restaurants and hotels that I loved, the lighting had been very well planned with beautifully designed and proportioned feature pendent lights then hidden up lights and down lights that highlighted certain aspects of the space. Often LED strip lights where inbuilt into the headboards of the beds, mirrors and window dressing bulk heads to create a soft light and welcoming ambiance. Unfortunately, this approach to the lighting plan is too late to integrate into our home however we did find the perfect pendent lights for over our dining table! Our next project is to either find something similar or to design and fabricate it ourselves which is of course much more fun! Next weeks blog post is heading outside with design inspirations from the lush, luxurious and beautiful outdoor rooms and gardens of Bali! After watching the fantastic 180 degrees south documentary, Luke and I along with our team have been looking at how we, as a business, can contribute to conservation. It wasn't until a recent day trip to the beautiful Otway Fly with its amazing birdseye view of the rain forest that inspiration hit! A beautiful Mountain Ash tree. As part of our commitment to running a sustainable business and our desire to improve the environment, we are donating a tree to 15 trees for every single piece of furniture that we produce in the future as well as every piece of furniture that we have produced in the past year. These trees are planted to reverse the environmental impact of all the processes involved in the production of the timber, the manufacturing as well as the freight. Previous clients will receive a postcard within the next month explaining the brilliant work of 15 trees as well as information on how to find out exactly where their tree/s have been planted! Every new client will also receive a post card with the details of their tree with their maintenance instructions. Coleen, the director of 15 trees, is going to have our first 100 trees planted in the Kinglake region of Victoria which is still recovering from the devastation of the Black Saturday fires on the 7th of February 2009. 15 trees is a "social enterprise" that has planted 51,110 trees to date on behalf of companies and individuals in locations Australia wide that are in need of regeneration. Trees are donated to conservation groups such as landcare, schools, universities, kindergarten’s, land owners and also directly to local communities in need after the devastation of a natural disaster such as fire or flood. We have chosen to support this company as we like the simplicity of knowing exactly how many trees have been planted on our behalf as well as where the planting has occurred. We also love that 15 trees fills in the gaps missed by other organisations and government bodies. In addition to our 1 piece = 1 tree initiative, the staff from Bombora Custom Furniture spend a day every year assisting our local branch of Landcare. Landcare is the joint effort between the local community, government and business to protect and repair our environment. Local landcare groups are run by volunteers who establish their own priorities and projects with the support of the larger Landcare network. Our local community in the Surf Coast region are very passionate conservationists with a massive 8 groups just within the suburbs of Torquay and Jan Juc! I have seen the great work that these local groups have been doing in regenerating the deep creek, spring creek and Jan Juc creek waterways, the replacement of weeds with natives in the dunes throughout the region and plantings at the local parks. We greatly look forward to continuing to this great work! Bombora Custom Furniture is a family run business in Torquay on the Victorian Surf Coast run by Luke and Alison Collins. We specialise in creating beautiful pieces of refined recycled timber furniture with a timeless aesthetic. Contact us here to discuss your project or alternatively contact Alison on 0407-906-799. The bed is the centerpiece the boudoir and is the perfect starting place for styling. The beauty of a custom made bed is that you can design it to perfectly suit your personal style and the dimensions of the room. Whether your style is modern coastal, contemporary chic, organic or New York Loft, a solid timber bed is always a beautiful choice. Timber brings warmth and life to the space as well as a great balance for the softness of bed linen. Your bed can make a grand statement with a large footer and head board or subtle with a simple frame. Here are a couple of examples of beautiful solid timber beds we have custom made for clients in the past. The Blue Moon Oregon timber bed is the quintessential modern coastal bed. It is low lying with an angled headboard and matching bedside tables. The beautiful Oregon timber is warm in tone with distinct swirly grain patterns. The Hunters bookcase bed is low lying with a solid timber head board with plenty of storage space underneath. This piece was created from beautiful recycled Messmate timber with solid hardwood slats. The Zeally Bay custom made bed has been designed to be structurally solid whilst being visually light. The black powder coated steel base disappears into the darkness under the bed to maintain the clean lines. The beautiful timber used in this bed is American Cherry Wood. The Lorne point bed is a celebration of the beauty of recycled Australian timber. The beautiful recycled Messmate used for this piece is full of stunning natural sap and grain lines with the solid timber headboard and footer being in perfect visual balance . All of our furniture, including our beds are made to order. This custom service ensures that your piece of furniture is perfect for your particular tastes in style, timber type and character level as well as for the dimensions of your room. We love to collaborate with our clients to create the perfect piece for their home. Please contact us here to get started in creating your dream piece of furniture or alternatively contact Alison on 0407-906-799. With its angled legs, pale tones and subtle sap lines, the Bancora tapered leg dining table is sophisticated and modern. The natural features within the timber of sap-lines and grain patterns ensures that this piece is unique and a pleasure to look at. The design of the Bancora dining table sees this piece being at home in the majority of interior aesthetics from modern coastal, to organic and chic. 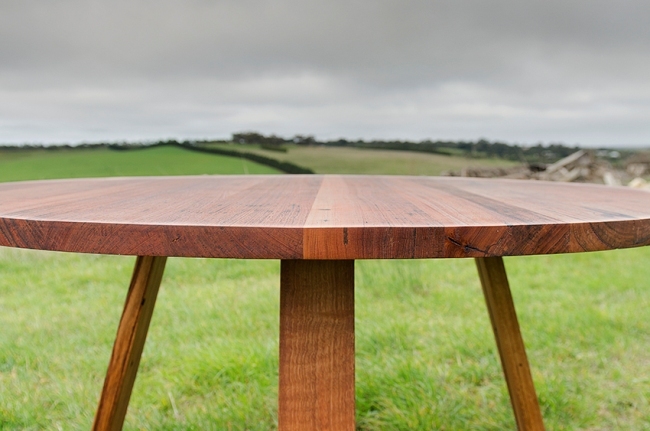 The table top is made from 40mm thick Wormy Chestnut timber and has beautiful light brown tones. The tapered and angled legs are made from beautiful 60mm thick recycled Messmate timber. All the pieces of timber selected for this piece are similar in tone and have low levels on natural and recycled features. At Bombora Custom Furniture, all our pieces are made to order to our clients specifications of size, timber type and character level. We can make this beautiful dining table for you at the exact dimensions your require to ensure the perfect fit in your space and with your chairs. It is important to us that you will love your new piece of furniture for many decades to come so enable you to either select the timber for your piece yourself or we can send you images for your approval. Please contact us here if you wish to discuss commissioning Bombora to create your dream piece of furniture. Alison Collins is to co-owner of Bombora Custom Furniture and is in charge of all things other than making furniture! Introducing our range of modern timber, rattan and metal dining chairs! After years of searching, we have finally discovered a range of modern dining chairs that we love! It was important to us to find designs that complimented our range of dining tables whilst maintaining the quality of construction and sense of timelessness that is integral to all things Bombora. The range of chairs by feelgood designs have both indoor and outdoor options. For those who love a bit of matchy matchy like me, a couple of pieces in the range are available as both an indoor and outdoor chair which is great for spaces that are adjoining. You can have one color inside and the other outside... perfection in my books! The dining chairs are constructed from a variety of materials. Some are all timber like the C170 and Elementary chair which are both constructed from American Oak. The natural finish looks great with an American Oak dining table or other light toned timbers such as Tasmanian Oak whilst the dark wenge or black stain looks great with recycled Messmate. The C250 and the C172 chairs combine timber with an upholstered seat. Both of these designs have a classic chair aesthetic that has been modernized with gentle curves and tapers. Rattan, a material classically found in furniture of the 1960's and 70's is making a comeback. Rattan is the name for nearly 600 different species of palm that are native to Africa, Asia and Australia. It is considered to be a sustainable choice as the trees are fast growing and don't need to be felled in order to harvest the material. In the C603 and reef chair, the rattan is paired with black powder coated metal. The range also reinvents the outdoor dining chair with woven seats and black powder coated metal legs. The silhouette is the similar in aesthetic to the indoor range rather than the more chunky timber form that is commonly associated with outdoor dining chairs. To view our full range of custom made dining tables, please follow the link. To inquire about commissioning Bombora Custom Furniture to design a build your dream piece of furniture, please contact us here. Alison Collins is the co-owner of Bombora Custom Furniture and is in charge of all things other than making furniture! What is figure or character in timber? Whether clean or highly figured, one of factors that separates Bombora from most other custom furniture makers out there is that we allow our clients control over not just the type of timber used to construct their piece but also the level of character. We separate character, often called figure, into recycled and natural features. This blog post is all about what character or figure is, how we define it and what it looks like. Formed by the growth rings of the tree, these vary in different species of timber from being strait, wavy, uniform, variable, tight or loose. These also tend to differ between reclaimed and new timber due to the different growing conditions. The level of tonal contrast between the grain lines is a identifying characteristic of the different species. In Oregon for example, there is only a slight change in tone but a great change of density which enables the wavy effect if sandblasted. These are the black sections on the timber where the sap has collected. Different species of trees have differing frequency and size of these features. Messmate for example has a high frequency of sap lines and pockets where American as Tasmanian oak has very little. We fill these with black epoxy to ensure a perfectly smooth and unbroken surface. A section of a piece of timber where a branch has come out of. These are a common feature seen in certain types of timber such as pine. Often cylindrical in shape with the timber a darker tone than the rest of the timber. A type of figure that is very rare and only occurs in a small number of types of wood. It is a pattern that resembles tiny swirling eyes that disrupt the otherwise smooth lines of the grain patterns. The cause of this effect is unknown and within our native Australian timbers is often found in Huon Pine and Jarrah. Often described as a gathered piece of silk, this feature consists of grains that cross the otherwise vertical grain pattern. It is thought to be caused by compression forces on the timber such as a heavy branch or prevailing wind but there is yet to be no definitive answer as it only appears in certain types of timber. River Red gum is a native species of timber that often has some fiddleblack figure. These are the result of human intervention or the remnants of the timbers past life. As with the natural figure, what is an imperfection to one person is highly desirable to another. Caused by the leaching of the iron into the timber, this occurs in areas where there used to be such hardware as a nail or bolt. This looks like a black stain in the timber and can be either confined to a small area or spread as in the image below. Occurs in pieces of timber that were exposed to large amounts of water in its past life such as pier or bridge timbers. This can create an awesome tiger pattern like effect. Holes in the timber where a nail or bolt used to sit. We fill these with black epoxy to ensure that the piece of furniture is left with a flat surface. Please contact us here if you wish to inquire about commissioning Bombora Custom Furniture to create your dream piece of furniture. Over the last couple of years, floating timber vanities have exploded in popularity and for very good reason. They are seriously beautiful and add such a sense of luxury and comfort to what has previously been such a stark and sterile space. Solid timber is hard wearing, holds its value and has that timeless aesthetic that will ensure that it will always be in style. Adding a solid timber vanity to your bathroom renovation or new build not only creates a beautiful space to be in, it also increases the value of your home long term. The nature of solid hardwood timber is that it is hard wearing and with a coat of the spray wax cleaner every so often will only become more lovely with age as a patina develops. Any wear and tear is reversed with a new coat of the spray wax and in the case of a major scratch, the surface just needs to be sanded and another coat of Osmo Polyx applied. This is not possible with a laminate, melamine or veneer product! Choosing to go down the custom made path when deciding on the vanity for your bathroom ensures that you will get a piece that is the perfect fit for your space, your functional requirements, your plumbing and your style. There are a couple of vital functional aspects you need to consider if you are designing your vanity from scratch; what do you want to store / display and how are you going to manage the waste pipes? Storage options are drawers, cupboards and open shelves all of which have quite different uses. Drawers are great for the items you want easy access to such as toothbrushes, hair brushes, hair driers and cosmetics. What is so special about a Bombora vanity? All of our vanities, whether is be one of our portfolio designs or a one off piece is customized to suit our clients needs. We alter the dimensions to suit your space, design the internal structures to suit your plumbing and basins and give you choice in the timber character level. We then create a personalized design drawing so you can see exactly what your vanity is going to look like. Every aspect of our vanities are created to order in Torquay on the Victorian Surf Coast. Is a solid timber vanity OK in the bathroom? Solid timber with the right finish is a great option for the bathroom if longevity is important to you. The finish that we use on our vanities is the same as on our dining tables and kitchen bench tops. In our house, with two small children, our dining table gets way harder use than our vanity ever does! We cure the wood using a high performance finish called Osmo which leaves the timber looking and feeling like timber. This is a natural product with oils that absorb into the timber for nourishment and deeper protection with a wax layer that sits on the surface. One of the best things about this finish is that it is fixable. If it gets scratched, it is easy to repair unlike other products such as laminex, veneer or epoxy finishes. Another option that lots of our client are choosing is to use a stone or marble top on the vanity. We work with a local stone mason who can provide and fit the stone or are very happy to work with our clients preferred supplier. Floating timber vanities are a beautiful addition to any bathroom. The timber visually softens the harder materials such as the tiles, concrete and mirror and the space underneath makes the space seem larger. If you are wanting to put a floating vanity in your new home or bathroom renovation, it is important to discuss this with your builder in the early stages of planning to ensure that the necessary support structures are put in to take the weight of the vanity. This may be putting in additional noggins, a steel support or even changing the design of the bathroom layout to ensure there are 3 walls to attach the vanity to. We offer 3 different materials to create the internal structures of our vanities. Solid timber, birch ply and melamine. No matter which option you choose, the vanity will look exactly the same from the outside. These alternatives provide a different price point, lead time and aesthetic preference. To discuss your project with us, contact us here. To view our range of solid timber vanities, click here. We are very fortunate to have the opportunity to design and build our own home which is thankfully, after 2 years of planning and construction, nearly complete. We went through the design process in the opposite direction to most. We started with the furniture we wanted, the inbuilt cabinetry and bookcases then designed the house around it! The "hero piece" for those fans of the block within our dining / living area, is an awesome American Oak and black powder coated leg usable work of art. We went through the process of how many people we wanted to seat, in what configuration and decided on the dimensions of the table and then the space from there. Here are some aspects to consider when purchasing or designing your new timber dining table. There are many labels for design styles such as lux industrial, glamorous, modern, contemporary, organic, Hamptons or french provincial. Through working together with clients on the design of their furniture over the years, many are concerned whether the new addition will match the rest of their interior. My advice is simply to find something that you love rather than following what is on trend. If everything within your home is something that you love, it will all work as each item has you in common. Just get out of your own way and trust yourself! Goldilocks and the three bears where onto something, it has to be just right! The dimensions and proportions of the piece is a very important factor in determining the success of the piece in the overall design. A dining table that is too big or too small for a space and the chairs just wont look right. Aside from the design aspect, when determining the size of the table, you need to consider the space where it will go and the access to this final resting place. It is all good and well to create for example a stunning round dining table with a diameter of 2.5 m but if you can't get it through your doorways, corridors or up your stairs, you are in a bit of trouble! If you want more information on how to determine dimensions for your dining table for the number of people you want to seat or if it will function in your space, please refer to this blog post. The final aspect to consider is the usability of your new piece of furniture. Even through we love our timber, we do not have the time or patience needing to be precious about the surface. It needs to be hard-wearing, easy care, non-toxic and easy to repair. As a household with 2 young children, our dining table is used often and used hard. With each meal it gets covered with food and treated harshly by the cutlery and crockery. The timber the dining table is made from as well as the finish determines how easily the surface is damaged and the ease of repair. Osmo, the natural oil and wax finish that we use is of the highest quality and creates a surface that is resistant to water and stains as well as penetrating into the timber for further protection. The surface is easy to maintain with a reapplication of the finish approximately every 3 months or as required. If the surface is damaged by a scratch, it is easily repaired with a spot reapplication of the wax or spray protector. Even with the scratch, some protection remains within the timber as the finish penetrates rather than just sitting onto of the surface. If a repair is required, just the damaged section needs to be renovated rather than the whole surface. Click through this link for more information on the maintenance of the finish. A two pack, polyurethane finish creates a stronger barrier to liquids and stains than an oil and wax finish. However, when the surface barrier is broken with a scratch or over time with wear, if a liquid gets onto the surface, the finish is ruined and the timber is easily damaged. Discoloration, staining, flaking and cracking may then develop on the surface and the timber. To repair this kind of damage would require a complete resurface and reapplication of the finish. All of our furniture is made from solid hardwood timber without a veneer in sight! The hardness of the timber decreases the likelihood of the surface being damaged by force for example by a very hungry 1 year old banging his bowl on the table yelling "more" like in our house! We are fortunate to have access to a large range of Australian native hardwood timbers locally in a recycled form. There is great variety in tone and character to suit the majority of tastes. Please contact us here for more information on designing your dream piece of furniture. Alison is co-owner of Bombora Custom Furniture and in charge of all things other than making furniture! This week we have a guest blog post written by Narelle McDonald from healthy living spaces. Narelle is a mother of two who shares my passion for reducing chemical loads within the home environment to improve the health of families and the planet alike! An important factor of a healthy building is the quality of the air we breathe. As a Building Biologist, my aim is to create homes that will support and nourish you today and in the future. We view our homes as living organisms and refer to them as our third skin. This holistic approach encourages us to be conscious and aware of the choices we make in regards to our environment on a daily basis. Today we spend a lot of time indoors and if like me, you work from home and have young children well over 90% of your time can be spent at home. Our modern way of life can contribute to ill health and our homes can play a big part in this. Today chemicals are in everything such as building materials, clothing, bedding, furnishings, cleaning products and the list goes on. However it is often when we are making changes to our lives and our homes that these VOCs can be introduced in large numbers. The CSIRO completed a study that showed high levels of VOCs present even a year after construction was finished. Volatile Organic Compounds (VOCs) are found in a range of products, such as paints, adhesives, fabrics and wood preservatives, and they become airborne at room temperature. Formaldehyde is found in manufactured wood products such as particleboard, plywood, MDF. This is a known carcinogen and is banned in some countries but is used extensively in Australia. We are all familiar with the smell of a newly painted home, floors finished with polyurethane or the cleaning isle in the supermarket. That smell is actually a cocktail of chemicals that are off gassing from the material into the environment. When we are exposed to chemicals it is never just one it is always in multiples. The synergist effects of these are relatively unknown and unable to be measured. Common symptoms from exposure to VOC’s can include eye, nose and throat irritation, nausea, coughing, confusion, fatigue, dizziness, headaches and memory impairment (EPA 2012). Recently I have had a client who had just finished a renovation to her home. It included new cabinetry, renovated bathroom, painting and some new upholstered furniture. Days afterwards both herself and her children were suffering from some of the symptoms mentioned above. Investigating these types of products and finishes beforehand gives you the opportunities to choose healthier alternatives. · Query what, where and how the product was made. · Imported pieces are often fumigated so opt for local and Australian made. · Avoid MDF furniture and opt for natural wood finished in natural oils. · The more natural and untreated a fabric is the better it is for your health. Look for fabrics such as organic cotton, hemp, wool and latex. · When painting, opt for plant based, zero or low VOC paints, adhesives and sealants. · Use indoor plants to help purify your air. · Lastly use natural ventilation, open your windows whenever possible. The best way we can control our indoor air is to use low or ideally non-polluting building materials and products that allow our buildings to breathe. Understanding the choices available gives us the tool and the knowledge to make better choices. Even the smallest decisions we make can enhance our wellbeing, improve the health of our kids, our homes, our planet and ourselves. For more information on creating a healthy home you can either make an appointment for an in-home consultation or get a copy of Narelles E-Book by contacting her through her website www.healthylivingspaces.com.au. Zeally Bay Range - Contemporary furniture with reclaimed timber and black legs. We are very excited to introduce you to the Zeally Bay range fresh out of the Bombora workshop! Luke worked together with the clients to create a design that is in line with their new modern home, on trend yet with that timelessness that will ensure that the pieces wont date. The couple loved the character filled Messmate timber that is signature to Bombora with the black timber legs enhancing the contrast of the table top. All of the sap lines, pockets and recycled features have been hand filled with black epoxy resin leaving the surface completely smooth and gap free. The natural oil and wax Osmo finish is silky smooth to touch, hard wearing and lets the stunning natural beauty of the timber shine! The Zeally Bay TV cabinet is low lying with black sharply tapered and angled legs which perfectly compliment the sap lines of the timber. The push to open drawers and cupboards have the grain continuously running across the fronts attracting the eye over the piece. The box joints at the sides of the shell exposes the dense end grain and sap line pattern taking the piece to another level. The drawers are perfect for neatly organizing your DVD collection with the adjustable shelving behind the cupboards great for keeping your technology hidden from view. The beautiful timber was selected for this piece to have lots of character ensuring it was the showstopper in our clients lounge area. The timber brings a warmth to modern spaces and looks fantastic with polished concrete or timber flooring and carpet. The Zeally Bay dining table has that sense of lightness of the classic Scandinavian silhouette combined with the angled and tapered legs found in more contemporary furniture. The black of the timber legs ensures that the sap lines of the table pop. Breadboards were used as part of the design at the ends of the table creating a lovely change in direction of the grain patterns. The design of the legs make them look like they just emerge from the bottom of the table without any other supports. The angle and the positioning of the legs was designed so that they don't get in the way of legs to ensure the most is made of the room available. This beautiful design has been made with both a recycled Messmate and sustainably harvested American Oak. The Zeally Bay Sideboard continues the theme with stunning reclaimed Messmate timber and contrasting matte black metal doors. The elongated cutout handles are inline with the sleek design with the black of the doors enhancing the recycled and natural features of the timber. The design of the silhouette of the piece was inspired by the classic 60's form with the tapered legs mirroring the dining table and the TV cabinet. The box joint detailing on the shell of the piece exposes the beautiful dense end grain creating further visual interest. As with all of our furniture, all of these pieces are made to order to your specifications of size, timber type and character level as we want your Bombora piece to be perfect and a treasured part of your home so many many years. To inquire about any of these designs or working with us to create something unique to you, please contact us here.